When your septic system fails, Statewide Environmental Services LLC can meet all your septic repair needs, leaving you worry-free. Statewide Environmental Services LLC has more than 25 years of experience servicing hundreds of septic systems throughout New Jersey. Statewide Environmental Services LLC also offers septic system design and engineering services. Most septic systems can be repaired, often by replacing the failing components. Statewide Environmental Services LLC can perform a full septic inspection to establish the condition of your system and advise you of the options that best fit your needs. All repairs are done under permit and officially inspected. Your septic lines can become damaged, crushed or clogged over time, causing your system to back up and fail. Statewide Environmental Services LLC offers septic line replacement services from the home to the septic holding tank, from the septic holding tank to the distribution box, and septic lateral replacement. While your existing lines can be made of terracotta, cast iron or PVC, all Statewide Environmental Services LLC’s replacement lines are PVC, meet or exceed state and local requirements, and are NSF certified. Your septic field may need replacement due to poor maintenance, damaged components, soil compaction or improper installation — all of which can cause a malfunctioning condition. As a homeowner, you may also wish to expand your septic field to allow for increased capacity. Replacing your septic field normally requires excavation of the septic field to a site-specific depth determined by your engineer and local authority. Statewide Environmental Services LLC’s septic field replacement services include excavating down to the approved depth, disposing of and relocating material and components, and installing select fill, stone, new piping and final grade, assuring approval by the governing authority. Upon project completion, Statewide Environmental Services LLC will arrange for all final inspections and approvals. Over time, your septic tank may begin to breakdown and deteriorate. This may cause leaks and contaminate the surrounding area with untreated sewage. Broken septic tanks can allow raw sewage to surface on your lawn. At that point it becomes an extreme health hazard to you, your family and your pets. Our services include installation and replacement of septic treatment and pump tanks. We offer a choice of either concrete or plastic septic treatment and septic pump tanks, providing you with tank options to fit your needs and budget and address accessibility issues. Broken or faulty septic tank lids can be hazardous to your health and safety. When a lid starts to crack, it will emit unpleasant odors and become unstable, posing dangers to people walking on or around it. Statewide Environmental Services LLC can correct your problem. Risers can be constructed of concrete or Polylok plastic. 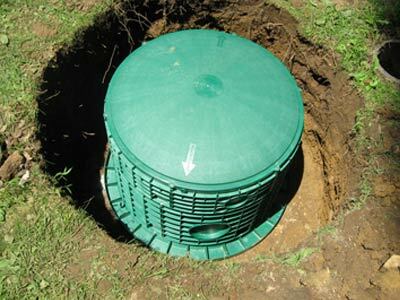 Septic tank lids can be constructed of cast iron or plastic, both of which are certified and lock for safety. Septic tank risers are required on new installations and are recommended for existing septic holding tanks for ease of access. The distribution box located in your septic field is designed to accept treated effluent from your septic holding tank and distribute it equally throughout your septic field by means of septic laterals. Whether your distribution box is made of concrete or plastic, it can become damaged over time. Damages usually result from deterioration, improper installation, or something heavy being driven over and crushing it. Statewide Environmental Services LLC will install a new distribution box — concrete or plastic — in one day. Permits are required for any field repairs. Your on-lot wastewater system’s septic treatment tank has two or more baffles. The inlet baffle is connected in the septic holding tank, or permanently mounted on it, at the end of the inlet line. The inlet line is the pipe that runs from your home or business directly into the septic tank. The inlet baffle is designed to direct product (solids and liquids) entering the tank downward. Your tank’s outlet baffle, which also can be connected to the outlet line or permanently connected to the holding tank, is designed to block floating scum and sewage from flowing outward into your drainage field and effluent piping. A gas deflector should be installed to restrict gas bubbles, thus reducing the carryover of solid particles to your septic field, providing treated effluent to the absorption area. The baffles in your septic holding tank, especially the outlet baffle, are crucial components and, if malfunctioning, can cause serious issues with your septic system. Statewide Environmental Services LLC can install the inlet and outlet baffles. Effluent filters can be installed in the outlet baffle to assist in reducing waste solids or particles from entering the septic field and potentially clogging your septic laterals and soil. If your septic field or tank needs replacement, we can assist you from start to finish. Statewide Environmental Services LLC is registered and certified with the New Jersey Department of Environmental Protection’s Registered On-Site Wastewater Treatment System Professionals and is a licensed installer.